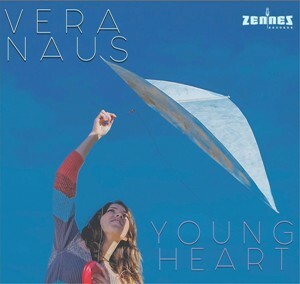 Vera Naus has a passion for music since her early childhood. And especially for singing. She picked up classical vocal lessons at the age of 11, after several years of studying piano, flute and bass. Vera discovered jazz when she was 14. During her studies at conservatories in The Netherlands she also got to know the beauty of both Western and Indian Classical music. Young Heart is her debut as a singer/writer. The album contains 10 original compositions that show the variety of musical styles that influenced Vera throughout the years. The lyrics are about personal stories of a young heart in search for happiness in a big world. Vera Naus has been performing with different bands (also pop and rock) since 2004. Her contemporary quintet is a blend of experience: Angelo Verploegen, Jasper Somsen and youthfulness: the Edison Award winning Sebastiaan van Bavel. Vera picked up a prize herself at the Leidse Jazz Award, honored by the audience for her performance that the jury described as “thoughtful, intellectual and great storytelling”.